The footing we provide our horses is one of the most important aspects of a riding arena. The amount of concussion the footing absorbs from the horse’s legs, the quality of its drainage, even its life as the particles are tramped down through daily use, are all variables to consider and all you should evaluate. How do you choose your riding arena’s footing? Here are a few initial items to consider when looking at footing options. Exploring a bitless bridle option for your horse? It’s become more and more common, with technical bridles hitting the market that are a step away from the traditional hackamores that once dominated the shelves. A horse might benefit from a bitless bridle for any number of behavioral or physical problems. These include head-shaking, bolting, tooth grinding, or bone spurs in the mouth. If a bit is causing your horse any sort of pain, you definitely have options. So what’s out there? Let’s look at a few bitless bridles and how they work. This is it! 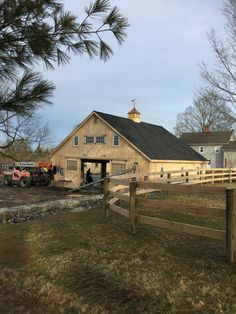 You’re going to build your dream barn. You’ve been on the Internet, clicking through Pinterest, admiring the equestrian palaces that the world’s luckiest equines call home, and picturing it all on your own plot of land. You know what you need: a center aisle with four stalls, perhaps, or a nice breezeway style barn with lots of fresh air and three bright stalls. 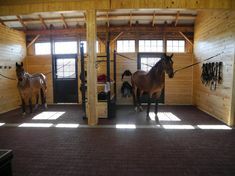 Or maybe it’s time for a professional showplace stable, with plenty of room for all your clients’ horses, elegant fittings, and roomy tack rooms. Recently on our Facebook page (facebook.com/equine.architecture) we’ve shared some photos of horses swimming that have been very popular. Swimming, along with hydrotherapy and water treadmills, is rising in use for horses recovering from a variety of ailments and lamenesses. So what is swimming for horses all about? The horse world is steeped in tradition, but loves a good trend. Trends come and trends go, but some of the oldest and best-loved traditions aren’t wrapped up in fashion or training methods but in the simple interest of keeping horses and riders safe. Take tail ribbons, for example. Different colored ribbons in horses’ tails send different messages about that horse — messages you’ll want to be able to read. Do you know your horse tail ribbons?